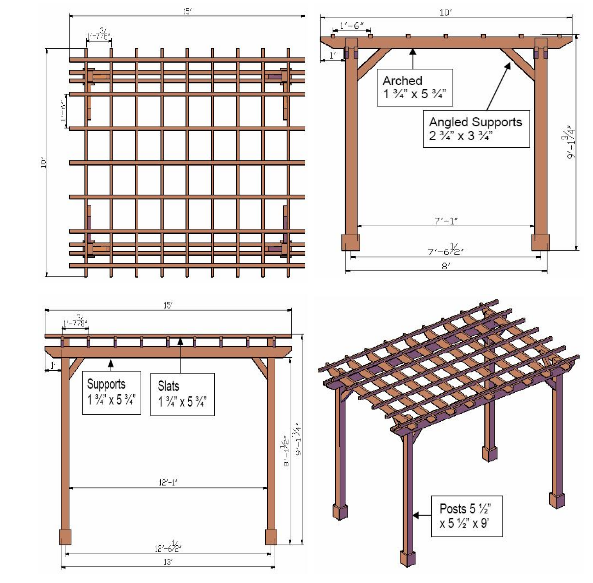 Do you have any idea how easy it would be to adapt any set of pergola plans into your own? Unless you have a very large, level yard that is essentially a blank canvas allowing you to install or build just about any pergola design or pergola kit available, then you most likely need to create your own unique set of pergola plans. Drawing out your own will ensure that the pergola fits your yard exactly to your needs. Perhaps you want to cover a concrete patio that was poured just outside the sliding glass door leading to your back yard. Instead of having the four posts and second set of beams pictured above, you would have a ledger board attached to the facing of the house and the roof pieces would only have fancy end cuts on one end. The pieces that attached into the ledger board would have a standard flat edge cut. You would also only have two knee braces or angled support boards. Maybe you do want a detached pergola, but just in a different size. The pergola pictured above has a roof line dimension of 10 x 15. That might be too large for your space so you adjust your plans accordingly. A square roof line of 10 x 10 or 12 x 12 is also quite common and easy to draw. You would perhaps have a few less rafters. For instance, in the drawing above there are 9 rafter pieces spanning the 15 foot length. Reducing it to 12 feet might drop the rafter count down to 8. Of course, roof dimensions alone do not drive the number of rafters and slats on your pergola design. The amount of shade you desire is also a huge factor. You many want more slats across the rafters to increase the shade provided. Or, you may want to keep it open and light and not even have that second layer of slats at all. Pay attention to the overhang dimensions as well. In the sample above, the roof piece extend out one foot on either side of the posts. Visually, you want to plan that out in your yard to see if that will create the site line you desire. It is always a good idea to place some temporary stakes and string up some construction line to test out what views might be blocked. As always, once you do draw out your own pergola plans, you will still want a step by step guide on how to build from your plans. With plans and a guide, you will have no trouble building your own pergola. Unfortunately yes, that is true – BUT – there is a very easy work around. Carefully mark out on the patio site exactly where you would place the posts for your desired pergola design. Measure out all angles and distances to make sure your lines are true and level. We suggest marking out the diagonals to the center for a four post square or rectangle design to make sure they are equal. Once you have the exact placement set, you would need to remove the stone pavers at those spots. Dig holes in the ground to the depth necessary to go below the frost line in your area (if that applies). Typically that is at least 2 feet, but could be more to account for potential frost heave. Pour cement footings and then set in place Simpson Strong Tie bracket mounts. When dry, secure posts into the bracket mounts and return the pavers to surround the posts. 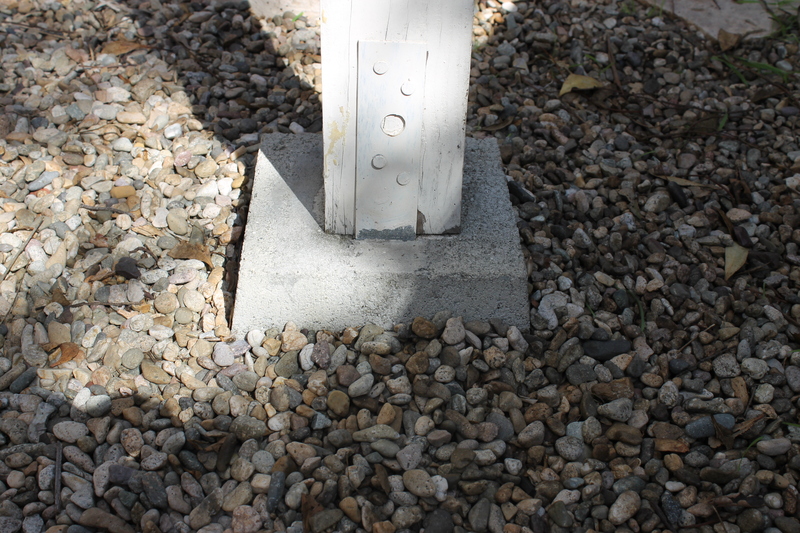 Post secured into concrete footing with stone surrounding. The concrete footings will provide the stability that the stone pavers could not and will ensure that the pergola would meet any city building codes and, more importantly, that it will stand solidly in place for years. Sign up here for an outstanding Pergola Building Preparation E-Course that will make sure that you learn and follow all the best steps to building the perfect pergola for your yard that will stand the test of time. What you should know about building permits for a pergola. A handyman recently asked me if his customer needed a pergola permit for their project or not. 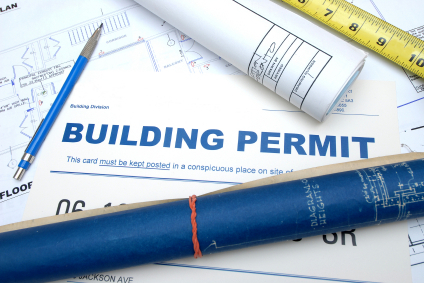 Since this is a fairly common question whenever anyone is looking to add a structure to their yard, I thought it would be a good idea to outline some basic permitting rules. Every city has different regulations and laws so I cannot just tell you straight out whether you will need a permit or not. We always start with this site to find the local website or office the covers this topic. There is about a 50/50 chance you will need a permit according to our experience. If you are attaching your pergola to the side of the house, the chances are a bit higher that you will need to comply with some structural rules. Now, since a pergola is not a true room addition without walls and without a complete roof, even when a permit is needed, the guidelines are less strict in order to get clearance. In other words, even if you need to get one, you should not let this deter you as it is a very simple process. We’ve found that simply submitting the pergola plan with dimensions and a material list along with a photo of the intended site for the pergola, that permits are very quickly issued if needed. A more critical potential source of building restrictions would be a homeowner’s association. If you live in an area that is covered by one, then absolutely do NOT skip clearing your plans with them. 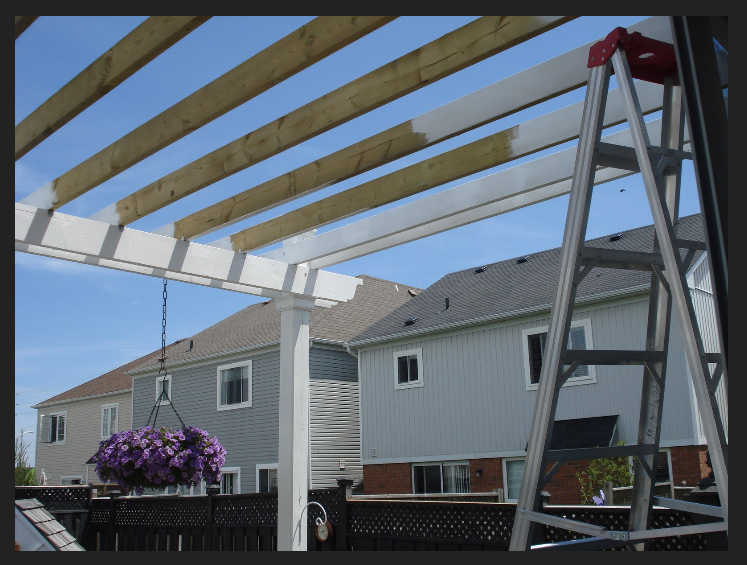 Even though we’ve covered this topic before, I feel it is something that needs to be discussed every so often to keep it fresh for new visitors because it is such an important place to begin when you are considering a do it yourself pergola building project.